When WWE rocked up at the Phillips Arena in Atlanta, Georgia on 13th November, it was the last stop for the brand before Survivor Series. 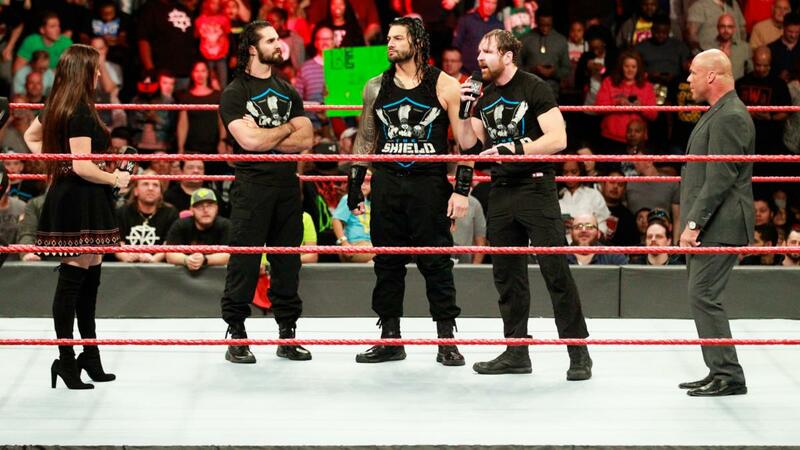 The show featured the return of The Shield (Roman Reigns, Seth Rollins & Dean Ambrose) as they addressed The New Day (Big E, Kofi Kingston & Xavier Woods) appearance at 1276, before taking on Intercontinental Champion The Miz and RAW Tag Team Champions Cesaro & Sheamus, Triple H returned to join RAW Men's Survivor Series team following Jason Jordan's match with Bray Wyatt and Paul Heyman addressed Brock Lesnar's match at Survivor Series with AJ Styles. But was it any good? The main story this week was Roman Reigns' returning from illness and joining Seth Rollins & Dean Ambrose for The Shield's first match since Payback 2014. This dominated the first two hours of the show, with the group initially appearing in the opening segment, interrupting Stephanie McMahon just as she appeared to firing Kurt Angle as RAW General Manager. The interaction between McMahon and Angle was on a similar level to what we saw at 1275, with McMahon throwing storyline barbs about Angle letting Shane McMahon manipulate him and also including his son, Jason Jordan, on the RAW Men's Survivor Series team. Angle's reply of "He's very talented" made me smile because it came across as a little lame, but quite cute at the same time and opposite the fiery, condescending McMahon this stood out even more. It seemed weird for McMahon to cut off Angle with more derision after he fired up and proclaimed he was going to break Shane's ankle, but that bought out Reigns, Rollins and Ambrose and seemingly planted more seeds for the future. 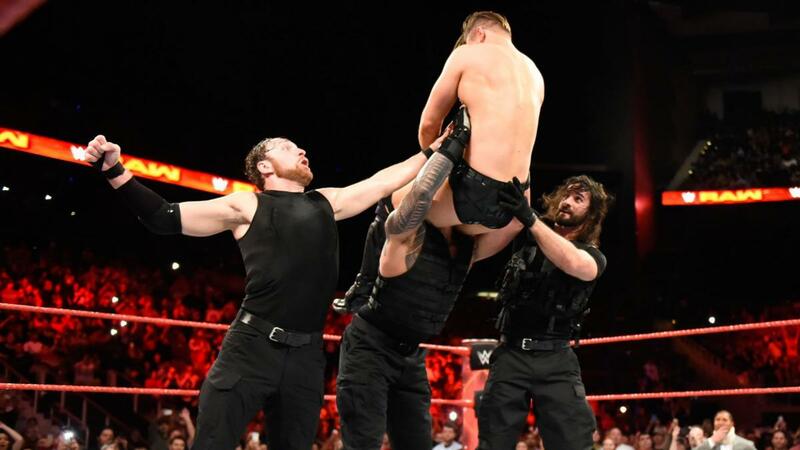 Atlanta was hot for The Shield, popping for Reigns bringing up McMahon going through a table at WrestleMania 33 in April and doing so even more when the challenge was made for a match with The New Day at Survivor Series 2017 on Sunday. There was lots going on here, but the main point is we're getting The Shield vs. The New Day on Sunday, which should be a joy. Miz TV was an unnecessary segment this week, doing a similar job to what could have been accomplished with a backstage interview. Intercontinental Champion The Miz chatted about Survivor Series opponent SmackDown's United States Champion Baron Corbin, getting a positive reaction from the crowd, after a passionate promo. Miz has been owning it on the mic for some time now and part of that is because he sounds like he believes what he is saying, as opposed to other roster members who regurgitate script. Sheamus & Cesaro's promo was a solid effort, trying to create an issue with The Usos, but also repeating lines we've heard for weeks about "B-Shows". They closed off with a cute line about having a "jailbreak on the Uso penitentiary", before talking a little bit about The Shield. The performances were good, but there was very little new information given out and when you have a segment taking up around eight minutes (plus entrances) off television time you'd expect a little bit more. The Shield's return to the action in the main event was solid match, that lacked some of the wildness of their memorable contests with the likes of The Wyatt Family (Bray Wyatt, Luke Harper & Erick Rowan at Elimination Chamber 2014, RAW 1084 & Main Event 80), Team Hell No (Daniel Bryan & Kane) & Randy Orton (SmackDown 721) and Evolution (Triple H, Batista & Randy Orton at Extreme Rules 2014). 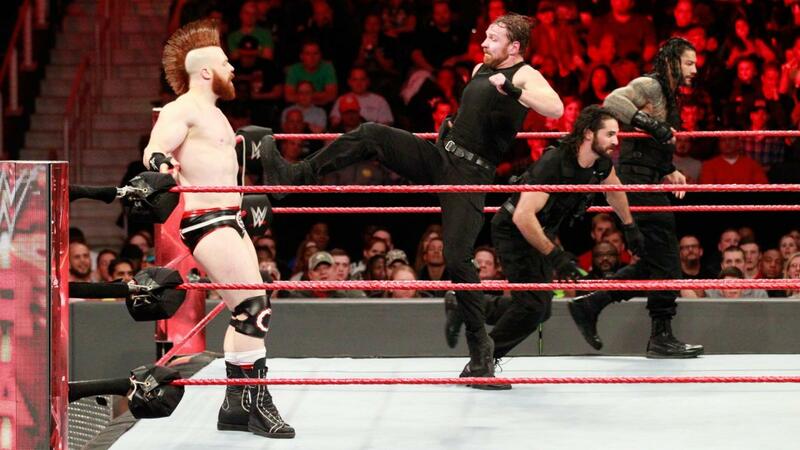 The bout fit into a basic template, with Ambrose and Rollins taking time as the face in peril, before a Big Dog Hot Tag lead quickly into a brief breakdown sequence. As a build up match for The New Day on Sunday, it did it's job for The Shield reminding us of some of their signature spots and giving them decisive victory over rivals they've had for months as Reigns pinned Miz following a Triple Powerbomb. I'm not sure what it did for Miz, Cesaro & Sheamus ahead of their matches at the PPV though. This was still a good television contest, with the work heading into the ad break, as well as the pacy breakdown sequence standing out in particular. Kurt Angle addressed his RAW Men's Survivor Series team, booking Samoa Joe & Finn Balor against Karl Anderson & Luke Gallows, Jason Jordan against Bray Wyatt and after Braun Strowman demanded the match, Strowman vs. Kane. It seems clear to everyone but WWE creative (read: Vince McMahon) that the way they are booking Jason Jordan isn't working and this was another misstep in what is becoming a storied list of missteps. 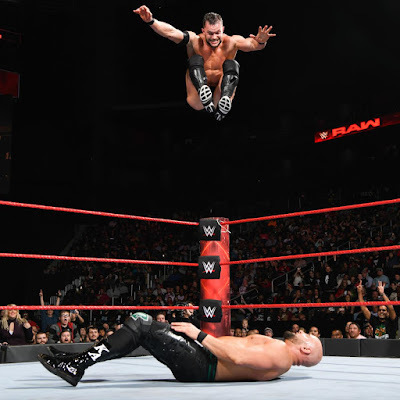 Jordan worked the match as the never say die babyface, battling against a knee injury to defeat Bray Wyatt with a school-boy roll-up, despite Wyatt being a popular heel, who is already thought of as not getting the opportunities he deserves and also in his first TV match since September. After the match, Wyatt attacked Jordan, slamming his knee into the post, leading to the crowd chanting "Thank You, Wyatt" and then singing "Na Na Hey Hey" as Jordan limped away from the ring. In a poor backstage segment, Jordan pleaded with Kurt Angle in the trainers room to let him compete at Survivor Series. I'm not sure what WWE were aiming for here, but the interaction between Triple H and Kurt Angle was at the least cool to see. The same can't be said for Jason Jordan begging his father to remain on the RAW Men's Survivor Series team. Jordan gave it his best shot with the content he was given, but the content was trash and Jordan has proved that he isn't the best at delivering lines. I understand that the aim was to show the conflict Angle had and to build an issue between he and Stephanie McMahon, but having Jordan out there in particular was a counterproductive move, that resulted in the former American Alpha member looking like a massive loser. The crowd booed Jordan, cheered Triple H's return and pleaded with "The Game" to hit a Pedigree, which is exactly what they got. It seems almost inevitable that Jordan's interference will result in Angle being elimination on Sunday. The RAW vs. SmackDown Survivor Series match now has an average age of over 40 years old...make of that what you will. 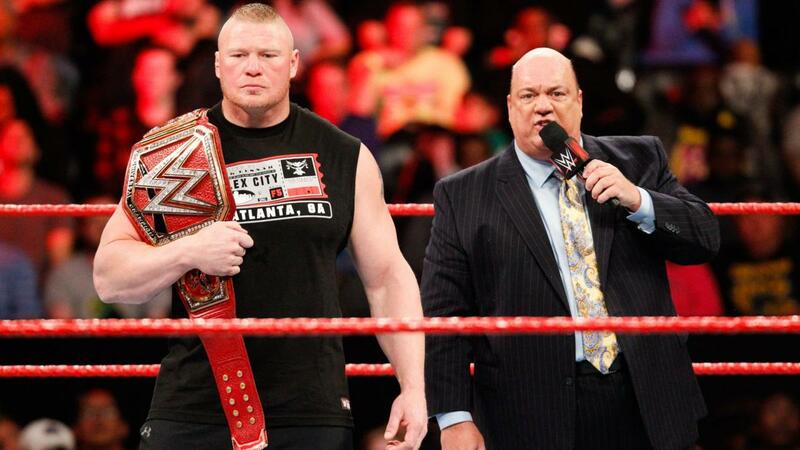 What else did you expect from Paul Heyman? Give the man a mic and something to sell and that man will sell it for all that's it worth. Basically, "The Advocate" said "Buy WWE Network, watch Survivor Series, AJ Styles vs. Brock Lesnar will be lit af", in his usual bombastic style. He made references to Rocky movies and WWE Champion Styles' underdog status, before reminding us that this isn't a Rocky movie and Universal Champion Brock Lesnar would prove that on Sunday. There's not really much else to say, it was entertaining and sold the match well, especially considering the short turn around time with Styles only winning the WWE Championship from Jinder Mahal last Tuesday. I found it interesting that Heyman made a mention to Finn Balor in the middle of the promo, perhaps sowing a few seeds for a programme heading in the Royal Rumble? Also a special mention to Heyman handling a marriage proposal in the crowd, pointing it out and quickly making sure it didn't disrupt what he had to say for all that long. Kane delivered a direct to camera promo, letting us know that Braun Strowman would find out tonight that The Big Red Machine is worse than death. 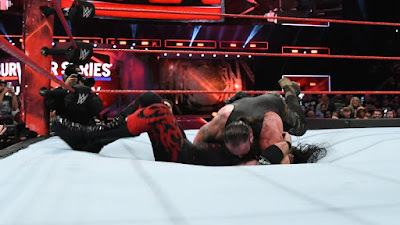 Braun Strowman was supposed to face Kane to close the show and whilst the two brawled, the match never officially began and the action quickly became a rough and tumble ringside plunderfest. I'm not sure why WWE didn't simply make the match No DQ or Falls Count Anywhere, but it doesn't really matter all that much. The crowd wasn't massively into it for the most part, obviously tired from a long taping, but the scrap with the steel steps and multiple chair shots was entertaining enough for what it was, except for a weird spot in the corner that lead into the finish. 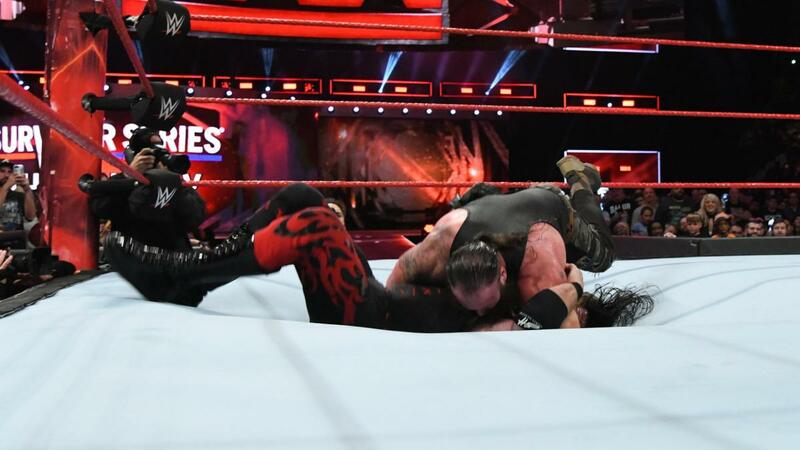 The segment concluded with Strowman hitting a Running Powerslam on the Devil's Favourite Demon, seemingly breaking the ring and another impressive stunt from the former Wyatt Family member. The moment got a good shock pop from the crowd, helped by the fact that a table had been set up on the outside and acted as a red herring. It was a shame that we didn't see Strowman emerge from the hole in the ring on TV as that was the moment the whole segment seemed to be set up for, instead the feed cut off with both big blokes lying in a whole in ring, which was, I suppose, a novel way to end the show! Before the match, Samoa Joe shoved Finn Balor to the floor as the pair argued over who would start the match. Teaming for the first time since winning the 2015 Dusty Rhodes Tag Team Classic at NXT Takeover: Respect (weirdly not mentioned at all by commentary), Finn Balor and Samoa Joe both looked excellent here, with a finishing sequence that was better than pretty much anything on the whole show. The story played out simply with Balor and Joe playing the reluctant, Luke Gallows & Karl Anderson taking control with Balor as the face in peril, before comeback saw Gallows do a Flair flop out a Pele Kick and Joe came roaring in with a fun hot tag and then a flurry of moves concluded with a suicide dive from Joe to Gallows and a Coup de Grace from Anderson to seal the victory. Joe and Balor are now 6-0 as a duo in WWE and NXT, so I'd be interested to see if WWE has them tag up post-Survivor Series, to fill time between that and Balor's programme with Brock Lesnar, especially considering the potential that a clash with Cesaro & Sheamus has. Obviously before his match Enzo Amore got some mic time, saying something about pockets and tostitos, whilst Drew Gulak ended up stealing the segment with some well-timed dead pan comedy. Firstly, the fact that Akira Tozawa & Kalisto's team weren't called Luch-Ahhhh is a travesty and should lead to someone getting fired, at the very least. Secondly, this was a solid match, highlighted by Tozawa's ridiculous suicide dive and Enzo Amore actually looking competent as he outsmarted both opponents to pin Tozawa following JawdonZo. A decent Triple threat here, but the fact that the Women only got 4 minutes of television time is laughable. 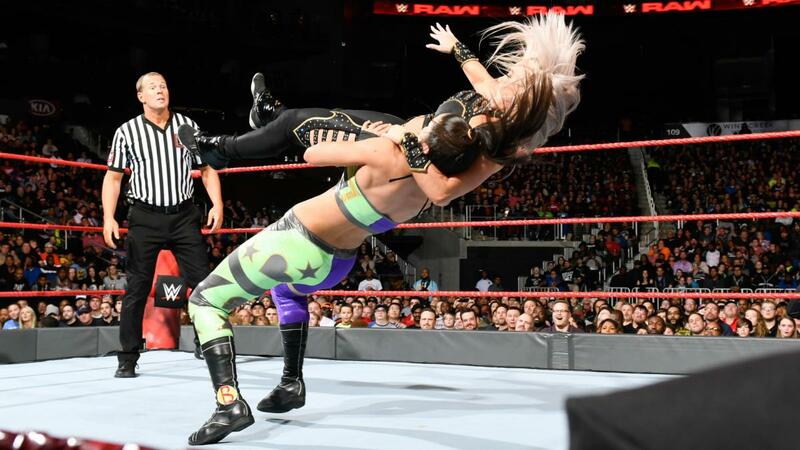 Dana Brooke seemingly turned back heel by getting into a scrap and being levelled by Asuka, whilst Mickie James had one of her better performances since returning working a lovely series of reversals with Bayley that would conclude with the Hugger getting the win following a Bayley to Belly. RAW Women's Champion Alexa Bliss talked about Charlotte Flair taking on Alexa Bliss for the SmackDown Women's Championship the next night, teasing that she might turn up to watch live, in an interview with Charly Caruso. The Snickers Great Moment in WWE History was Lita winning the WWE Women's Championship from Trish Stratus on RAW 602 from 6th December 2004. As a Survivor Series go-home when half of the match-ups weren't present, this show did it's job. 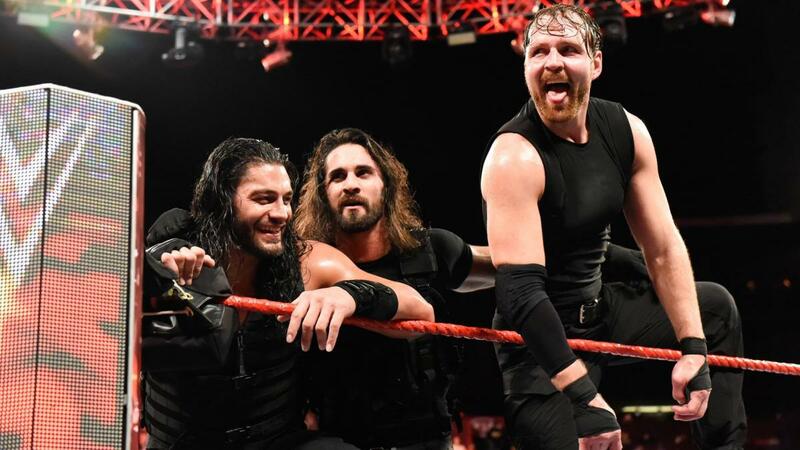 The Shield set up an enticing clash with The New Day and looked good in victory, Paul Heyman gave Brock Lesnar vs. AJ Styles the hard-sell and a big name was added to the Men's Survivor Series bout. It's a shame that along the way we got so much of the dire Jason Jordan storyline, filler segments like Miz TV, whilst the Women were once again under-served. There's some leg work to be done on SmackDown with all the Champion vs. Champion matches needing a little bit extra work to get them past the line on Sunday, with the Women's Champion collision in particular lacking any meaningful build. The Braun Strowman and Kane spot will get the most replay time, but I think I got the most out of the Samoa Joe & Finn Balor vs. Luke Gallows and Karl Anderson, almost purely on the electric finishing stretch.